Bob Marley & The Wailers was a reggae musical band created by Bob Marley during 1974, after Peter Tosh and Bunny Wailer ended their employment with the precursor band, The Wailers (1963-1974). The band ended with the death of Bob Marley during 1981. Bob Marley & The Wailers consisted of Bob Marley himself as guitarist, songwriter and main singer, the Wailers Band as the backing band, and the I Threes as backup vocalists. 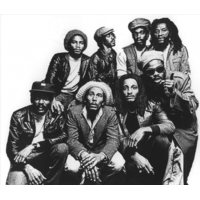 The Wailers Band included the brothers Carlton Barrett and Aston "Family Man" Barrett on drums and bass respectively, Junior Marvin and Al Anderson playing lead guitar, Tyrone Downie and Earl "Wya" Lindo playing keyboard, and Alvin "Seeco" Patterson playing percussion. The I Threes, consisted of Bob Marley's wife Rita Marley, Judy Mowatt and Marcia Griffiths. Sometimes, usually for marketing purposes, recordings are indiscriminately attributed to either "Bob Marley", "The Wailers", or "Bob Marley & the Wailers".